Emmelshausen can be easily reached via the network of public transport.The railway line Boppard-Emmelshausen is one of the most charming steep routes in Europe and a listed monument. The Hunsrückbahn effortlessly crosses two mighty viaducts. Emmelshausen is located at the motorway A 61 (exit Emmelshausen) or the 'Hunsrückhöhenstraße' B 327. Follow the signposts to the 'ZAP' (Zentrum am Park). Free parking is abundant. Anyone planning to travel by plane, landing on the regional airport Hahn and uses the shuttle bus to Emmelshausen. The journey time by car is 40 minutes. The next international airport is Frankfurt/Main. The journey time by car is 1 hour, by train and bus 2 hours. A hiking tour through the Ehrbachklamm (Ehrbach gorge) is unforgettable. Walking fans are always rewarded with imposing natural beauty and fantastic views. From Emmelshausen, the walk leads always downhill on a length of 16 km to Brodenbach (Mosel). Impressive viewpoints and numerous relaxation and well-being feel banks are waiting for the hikers. Starting point for a walk into the Ehrbachklamm is the tourist information centre (ZAP) in Emmelshausen. Here you will receive maps and information to the tour. Walking along the road, you reach after few minutes the Liesenfelder Bach. Follow the way to the Braunhöller Mühle (Braunhöller Mill). The mill was built in 1700 and is today a romantic land inn with restaurant, guest rooms and apartments. The way to the Ehrbachklamm passes over the Ehrbachtal and the Daubisberger Mühle (Daubisberger Mill). Now, the real adventure begins. For a period of about an hour, a path carved partially in the rock over several bridges along the stream, passing on steep slopes and boulders and ends in a forest path just before the Eckmühle (Corner Mill). Here then follow a wide path and passes through the Brandengrabenmühle (Brandengraben Mill). Slightly further down the Valley a rewarding detour is recommended up to the Ehrenburg built in 1120. The Ehrenburg is a castle ruin with a rather turbulent history. Then by the Freizeitbus Untermosel (Leisure bus Untermosel) it goes back to the starting point Emmelshausen (please reserve under phone 0674793220, at noon the day before). With the right footwear, even small explorers can easily master the way and the climbing in the Ehrbachklamm. The Ehrbachklamm is located between the Rhine and Mosel. What is the most relaxing after a strenuous walk day, than a good glass of wine. Boppard – for example – is a winegrowing centre and only 15 km away from Emmelshausen. Rheinfels Castle (Schloss Rheinfels) in St. Goar is one of the most impressive ruins on the Rhine. Vistors from around the world are surprised by the size of the ruins as well as from the plurality of tunnels and trenches, many of which can still be visited. Discover Rheinfels Castle by a Castle Tour – it is an adventure for young and old. Tip: Bring flashlights! This quietly-located, 4-star villa hotel in Boppard offers elegant, themed rooms, spa facilities and free Wi-Fi. 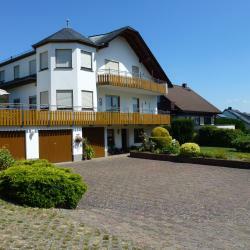 It is 600 metres from the River Rhine and Bad Salzig Train Station.